Kansas City, Mo. 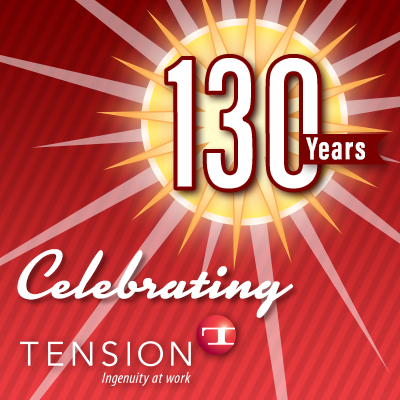 - On March 17, 2016, Tension Corporation celebrates its 130th anniversary, marking the company's long history of stability, ingenuity and commitment to its associates and industry. Founded in 1886, Tension continues to build upon the values its founder, William J Berkowitz, brought to the company. The values of integrity, treating associates fairly, and working hard to get and retain customers. "I believe that the worth of a company is determined by the values which are practiced day in and day out," said Tension Chairman of the Board, Bert Berkley. "My grandfather practiced the right values when he started Tension and those have continued through to today." President and CEO of Tension Corporation, Bill Berkley, said, "As we look ahead, we recognize the many contributions of our associates, the importance of changing to meet the needs of our customers and the market, and furthering Lean processes within the company to drive the business forward." Process, or method as Berkowitz called it more than 100 years ago, remains a cornerstone of success for Tension. Today, Tension uses Lean Sigma as its method for Continuous Improvement. Lean Sigma methodologies are instilled throughout all levels of the organization, driving innovative product development, waste reduction and quality improvement. "Tension is a leader in the industry," said Bill Berkley. "Our associates understand that our products and customer service must be of the highest quality. And, we know and understand that each day we need to bring the creativity and ingenuity to our work that has been the hallmark of this company." With its long history of adapting to the changing needs of its customers, Tension expanded into the packaging and pharmacy automation market in the early 2000s. Tension Packaging & Automation serves customers in the Internet order fulfillment business, and builds and equips mail order, central fill and specialty pharmacies. Today, Tension Corporation remains one of the oldest continuously family-run companies in the U.S. It operates as three divisions: Envelope, Packaging & Automation, and International. "As we celebrate our 130th anniversary, we reflect not just on our history but also on all the opportunities we have in front of us," said Bill Berkley. "We look forward to the future." Tension Corporation, a privately owned and operated company based in Kansas City, Missouri, is a global leader in envelope products and packaging & automation solutions. The envelope division serves a wide variety of industries including financial, insurance and direct marketing, and works with third party providers directly. Founded in 1886, Tension produces billions of envelopes annually and has regional plants and offices throughout the country and the world. Visit www.tensioncorp.com for more information.